Despite its detractors, the rebound continues, this time pushing up to 2,000. October has been one of the most painful months in years. Obviously the 10% plunge to 1,820 crushed bulls’ spirits, convincing many to sell reactively at steep discounts. But just as shocking was bouncing as quick as we fell. It started as the selloff bears have been predicting for years and they jumped on the short bandwagon with reckless abandon. Unfortunately, rather than take quick profits, most bears were whacked by this historically powerful short-squeeze. They climbed over each other to buy back their shorts and provided the bulk of the lift from 1,875 to 1,975. But as we return to record highs, most bears have already covered for a loss. Without their buying, what keeps pushing us higher? Now the market switched back to humiliating bulls, this time piling on a mountain of regret for anyone who sold the dip. Two-weeks ago they sold defensively, fearing catastrophic losses, now they are buying, fearing being left behind. The ironic thing is despite the towering losses many traders took this month, October will be a fairly good month, setting up for a very respectable 1% gain. There is a huge swath of investors wishing they were up 1% for the month. But their pain is someone else’s gain. But enough reflection, where do we go from here? Expect the rate of gains to slow as the market struggles with 2,000 resistance. This consolidation could last days or weeks, but plan for an eventual upside breakout. The recent plunge flushed out almost all the available supply. Anyone that held through a 10% selloff demonstrated an iron stomach and won’t be selling any time soon. 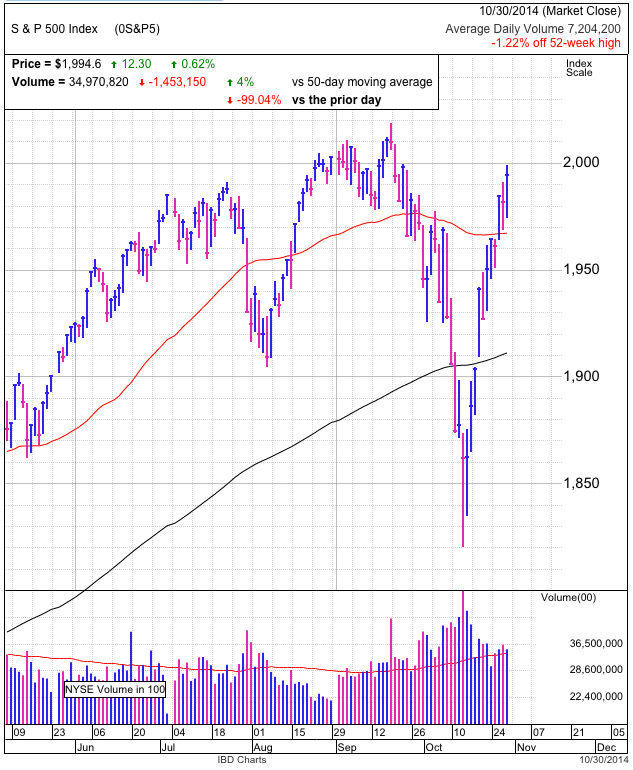 That keeps supply tight and makes it easy for the market to continue rallying on low volume into year-end as regretful sellers crawl back into the market. Another volatile, but ultimately uneventful session. While the spread between the day’s high and low exceeded 20-points, we ended down less than three. The headline event was the Fed’s policy statement and ending of QE. This was widely expected, but they also removed language about considerable slack in the labor market. To many this implies a sooner increase in interest rates and was enough to send the market into a quick, 10-point selloff. But rather than cascade lower, supply dried up near 1,970 and the market bounced, nearly recovering all the day’s losses by the close. The dip tested 1,970 support and the 50dma, but we held both. This is encouraging and gives credibility to the young rebound. If the market was teetering on the edge of another emotional plunge, this weakness more than enough of an excuse to set it off. But instead of rushing for the exits, most owners were indifferent and that apathy tightened supply, leading to the late bounce. While holding 1,970 is encouraging, we need to keep a close eye on these levels in coming days. If we slip under 1,950 by Friday, things could get ugly in a hurry. But close the week above 1,970 and the market is moving past the fear and uncertainty that gripped us in the first half of October. Stocks snapped a powerful, three-day win streak, giving back nearly 25-points from the intraday high. Under normal circumstances this would qualify as a wild ride, but given recent volatility, this was a fairly benign pullback. And we shouldn’t be surprised to see the market run into some headwind as traders lock-in a 130-point bounce off recent lows. 1,950 has been a meaningful technical level going all the way back to June, and it was again today. We rallied up to this level early in the day, but couldn’t break through and that is when the liquidation began. There was no real headline driving either buying or the selling, meaning most traders are still reacting to last week’s emotional rollercoaster. Right now we find ourselves stuck between the 200dma and the 50dma and will likely remain here for a bit longer. Today’s weakness will rekindle anxiety in those that regretfully held through the dip to 1,820, compelling them to sell proactively before they risk going through that pain again. That doubt and fear could easily push us back to the 200dma, but the real test comes next. 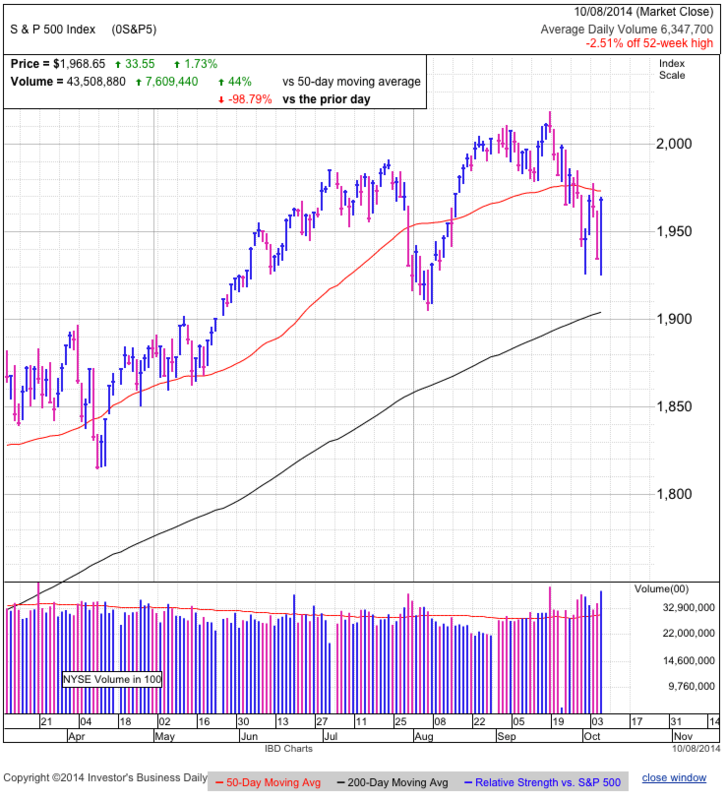 Does the market panic and plunge through the 200dma on its way to undercutting the 1,820 lows. Or will calmer and more confident value investors shrug off the volatility and take advantage of emotional selling to buy their favorite companies at a discount? 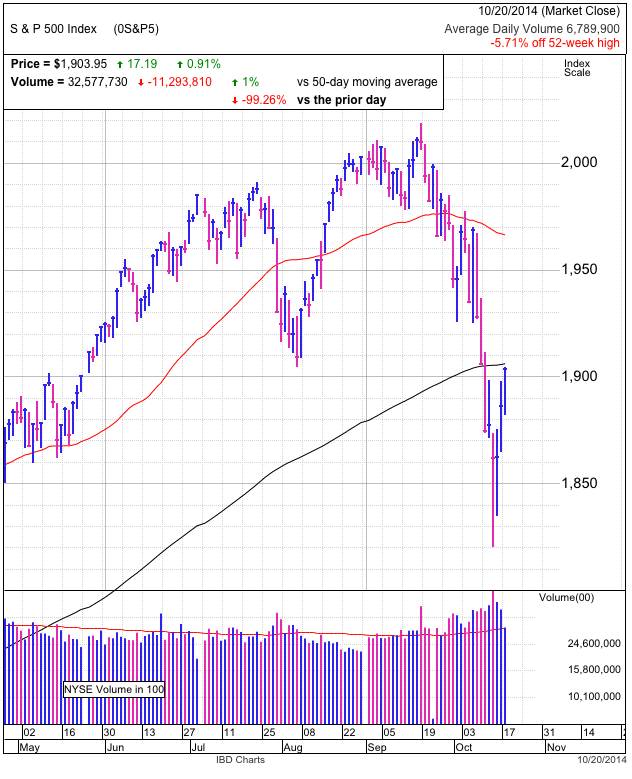 While the bounce remains fragile, a dip to the 200dma and 1,900 is a normal and healthy part of building a sustainable rebound. The time to worry is if we fail to hold support so soon after reclaiming it. Stocks continued last weeks rebound and closed just shy of the 200dma. Quite a reversal of fortune from the breathtaking plunge to 1,820 only days ago. Today’s strength is especially encouraging since it came on the heels of another European selloff. This shows many in the US are coming to terms with global weakness and they feel it is already baked into current US equity prices. Getting to the technicals, 1,900 and the 200dma are significant resistance levels and seeing the market struggle with them in coming days will be no surprise. But ultimately they should only be speed bumps on our way to the 50dma. How the market trades when we return to 1,950 will be far more insightful in determining what comes next. The big concern is if 1,950 forms the right shoulder in a much larger head-and-shoulders topping pattern. Failing near 1,950 and then undercutting the 1,820 lows means we have a lot further to fall and this could be the 20%+ correction many have been waiting for. But don’t worry too much about this since it is the worst case scenario. Most likely recent volatility flushed out any would be sellers and anyone who held through the plunge showed they are married to their positions. While this is a reckless attitude for traders to take, if we know they won’t sell, then we also know supply will be tight and that supports prices in the near-term. A down-day or two is nothing to get excited about as long as the selling is rational and orderly. Some people who were paralyzed by fear during the dip to 1,820 will naturally sell the bounce they were praying for. But once these regretful owners finish selling, look for a surge of buying to follow a break above 1,900. 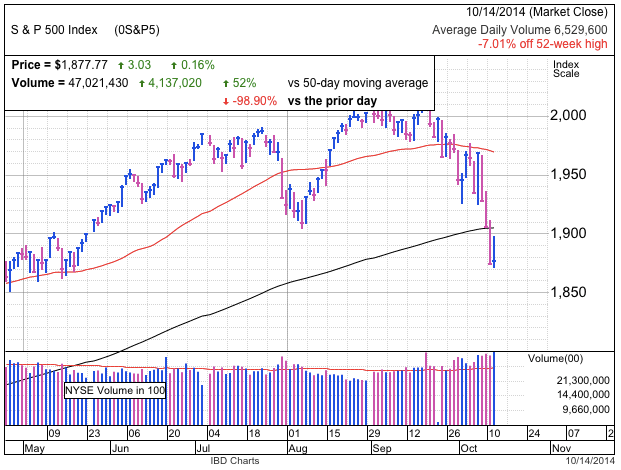 Today’s modest up-day halted a three-day, 100-point rout. The question everyone is asking is if this signaled the end of selling, or is just another temporary reprieve on our way lower. Volume was off the chart, even exceeding the pace of the last few days of free-fall. While we are only 7% from all-time highs, it sure feels a lot worse than that. The disappointing thing about today’s price-action is we were 20-points higher before another late-day collapse pushed us back near break-even. But maybe this isn’t a bad thing. The last few strong bounces turned out of be sucker’s rallies. A more measured response to the selling could be a welcome alternative to this month’s wild volatility. The tone we set on Wednesday will go a long way to letting us know what happens next. Another free-fall day and who knows where this thing will stop. But a sideways day could indicate buying is finally catching up with selling. There always comes a point in every correction where prices become so attractive, deep-pocketed value investors can no longer resist the urge to snap up discounted shares from desperate sellers. But that is the rational response and recently the market’s been anything but. In the wild, our ancestors were well served by adopting emotional cues from others in the clan. When everyone else was running, they started running too because those that stuck around to see what all the fuss was about quickly became lunch. And the same thing happens in the market. Few sellers over the last few days could clearly articulate why they were selling, which means they were selling primarily because everyone else was selling. The VIX is at the highest level in over 2-years. Every other time we approached this level, that signaled an imminent bottom and is likely the case here too. But imminent can mean different things. Obviously that includes a bounce tomorrow. But 48-hours from now also qualifies as imminent, even if it means falling another 75-points. The thing most investors need to keep in perspective is those with a longer-term outlook, this weakness is a blessing. While it always feels good to watch our accounts swell in value, there are only two prices that matter; what we paid and what we got when we sold. We want prices to be lower when we buy. Anyone who continued to invest in their 401k during the 2008 meltdown has seen those contributions more than double in value. They would be poorer today if we didn’t have that market crash. Markets go up and markets go down. The most successful are the ones who don’t let it get to them. Again the market bumped it’s head on the 50dma, giving back all of Wednesday’s gains and then some on exceptionally heavy volume. This is the most volatile trade since 2011 and it is doing a fantastic job of shaking off the summer’s complacency. We are a hair above recent lows at 1,925 and within easy striking distance of 1,900 and the 200dma. Given how volatile we are trading, we could easily tag these levels within the first hour of trade on Friday. While every dip over the last several years presented a great buying opportunity, the lack of a tangible headline driver and huge volatility make this time feel different from the Taper Tantrum, Fiscal Cliff, Greece, and other recent selloffs. But this back-and-forth also feels different from previous runaway selloffs like the 2011 S&P Downgrade correction that collapsed over consecutive days. Given the lack of recent precedent, it is harder to anticipate what comes next. While the financial press and talking heads blame the generic catch-all “global slowdown” for this selloff, weakness in Europe and a slowing Asia are nothing new. So why is it all of a sudden are recycled headlines causing owners to sell en mass? First we need to segregate traders by timeframe to identify who is prone to sell this weakness. Since we are less than 5% from all-time highs and virtually every buy-and-hold investor is sitting on huge profits, few of them are hitting the panic button and we shouldn’t expect the average 401k investor to panic. Next come the medium-termed investors who still think the economy is on the rebound and expects prices to be higher over the next couple years. These guys are not likely to sell and are probably looking at this weakness as an opportunity to buy stocks at a discount. The final group is the shorter time-framed swing-traders who try to time each gyration. These are the guys buying and selling each 50-point move. And while they are exceptionally active, they are also the smallest segment of the money in market. Long- and medium-term investors are unlikely to change their three- and five-year economic outlook based on these ambiguous headlines, so we should expect them to continue holding. Shorter-term investors are reacting to these moves and given recent volatility, the market has already tripped up a large number of them, reducing the number of them left to sell. While a dip under 1,900 and the 200dma seems highly likely at this point, both bulls and bears should expect a bounce shortly after. The bull is looking for a decisive rebound to new-highs while the bear is expecting the right-shoulder of a head-and-shoulder pattern. Trading is never easy and the answer will only be obvious in hindsight. Stocks surged to one of the largest gains of the year following accommodative language from the Fed. But it wasn’t all smooth sailing when early trade saw us slip to 1,925, ever so slightly undercutting last week’s lows. If this holds, that counts as a double-bottom, one of the most common bottoming patterns. While journalists and talking heads credit today’s strength to the Fed, the news was actually quite bearish. The Fed is concerned about weak global growth and how a strong dollar will adversely affect the domestic recovery. But the half-full crowd cheered because that delays the inevitable rate hikes and who doesn’t like cheap money? But regardless of the headlines, there were only so many people left to sell following the last several weeks of gut-wrenching volatility. Once the pessimists sell, they no longer have a vote in what the market does next. Those that held through the weakness and those that bought it exhibited confidence and their conviction kept supply tight and propped up prices. While the dip was unnerving, it is very Chicken-Little like to let a 4% pullback make us think about jumping out of windows. But that is the nature of markets; dips only work when they convince everyone the world is imploding. Thursday is an important day for both technicals and sentiment. While today’s rebound was impressive, it still left us shy of the 50dma, something that acted as resistance over the last week. Stall again and there is little doubt we are headed back to 1,900. But if we break through, look for a continuation to all-time highs in coming weeks as bears scramble over each other to buy back their short positions. At the same time, don’t expect fireworks since moves tend to be fairly symmetrical. A 75-point dip typically only leads to a 75-point breakout, but that would push us close to 2,100 by year-end. The bigger concern is if the rebound stalls and the selloff spirals out of control, shattering the nerves of previously confident owners, turning them into fearful sellers. There is no doubt we have a date with a larger correction, the only question is if happens this fall, or waits until next year. But, rather than guess, we will let the market show us. The relentless selling continued in the first half of the day, but in typical fashion, the market overdid it and snapped back to breakeven by the close. It was a fairly dramatic reversal, covering nearly 50-points combined. 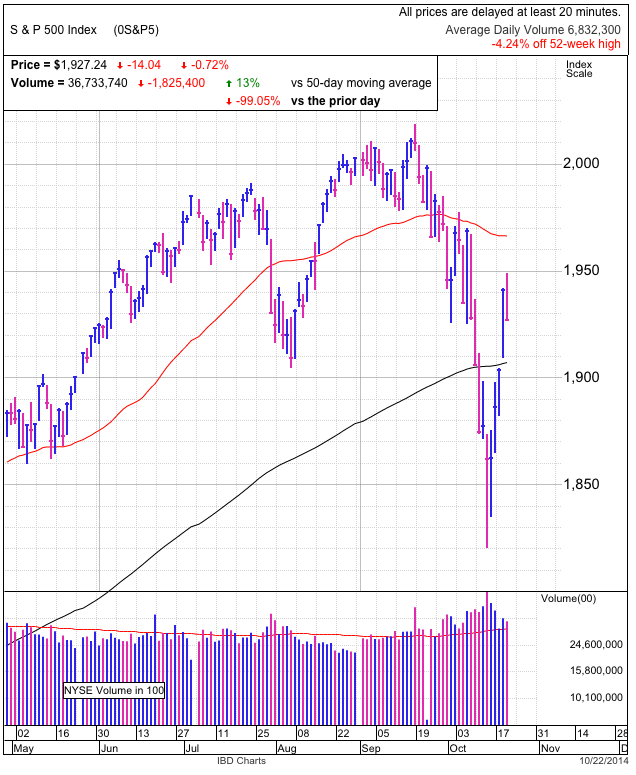 Volume was brisk for the third-day in a row as traders both bailed out as the pain got too great and chased the ensuing afternoon rebound. Again there wasn’t an individual headline driving the selling and the weakness felt more herd-like when many traders dumped shares simply because everyone else was. But there always comes a point where we run out of sellers. When no one is left to sell, supply dries up and prices rebound. No matter what the headlines, tight supply props up prices and that was the case this afternoon. 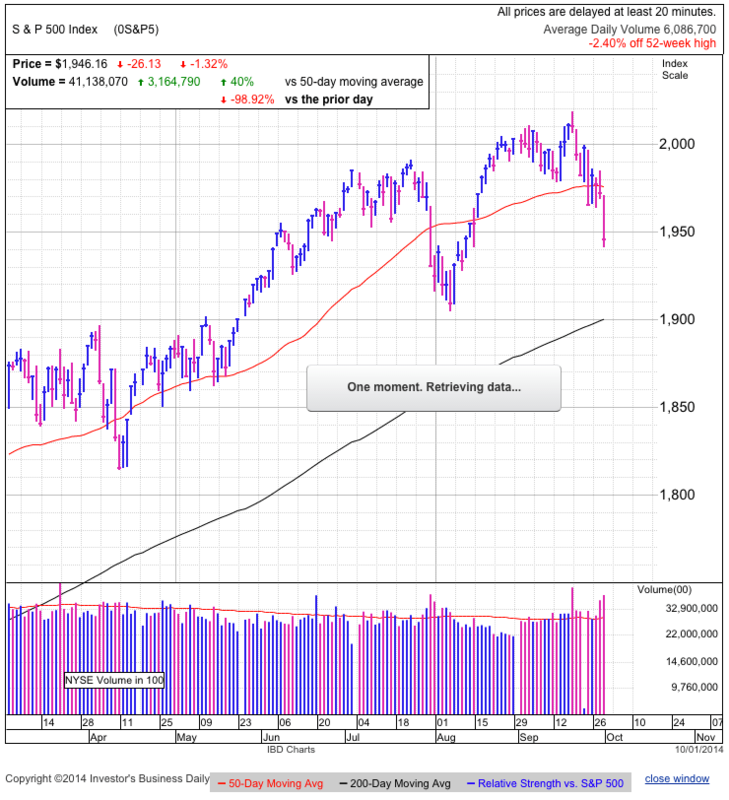 If today’s low holds, the bull market remains intact because this is a higher-low than August’s 1,900 dip. While pullbacks always feel like the world is ending, as long as we keep stepping higher, all is well with the market. But what are the chances this low will hold? Markets move for one of two reasons. New information causes the majority of traders to adjust their forward-looking outlook. Whey they change their mind, they buy or sell stock to reflect their new expectations and this one-sided trade moves markets long distances. The other source of volatility is normal fluctuations in supply and demand. The former is what big market moves are made of because the new information converts bulls into bears or bears into bulls. It takes a fundamental shift in the underlying economics to drive these major changes in sentiment and so far the economic data we keep getting points to a slow, but steady recovery in the US and a struggling recovery in Europe. None of this is new and unlikely to change anyone’s mind. When bulls stay bulls and bears stay bears, what we are left with is the market’s normal gyrations due to minor imbalances in supply and demand. This is when we go a little too high and then turn around and go a little too low. Obviously the push to 2,020 a few weeks ago was a little too high and now it appears like 1,925 is a little too low. During these typical gyrations it is most profitable to buy weakness and sell strength. If this bounce holds, we should not violate today’s low. The best trade is buying the dip with a stop under 1,925. It was another brutal day, smashing through prior support at 1,965 and ultimately closing under 1,950. Volume was some of the highest we’ve seen all year as traders reacted to both headlines and technical weakness. But the thing we must remember is routine dips only happen when everyone thinks the market is on the verge of plunging even lower. If everyone was confident this was little more than a buyable dip, they wouldn’t sell. If no one sells, prices don’t dip. Therefore by rule, to get the dip, we always need to scare a large number of people into selling. And clearly we’ve done that here. But what comes next? Is this really just another vanilla dip? Or the start of a larger correction? Despite all the prognostications of the bull’s demise, we haven’t done any real technical damage yet and the up-trend remains comfortably intact. The real threat won’t come until we undercut August’s dip to 1,900, making a new lower-low. Bouncing anytime in the next 40-points still counts as a higher-low and extends this resilient bull market. The real test will come in the next few days. Capitulation bottoms typically smash through support on huge volume. This is the point of maximum pain where previously confident owners cannot bear the mounting regret of not selling earlier and reactively pull the plug. Unfortunately for many, this breaking point typically happens near the bottom of the move. Once the last wave of impulsive selling washes through the market, supply dries up and we bounce. Today’s dip had all the hallmarks of a traditional capitulation bottom. But nothing in the market is ever clear-cut and one-sided. Rather than bounce, there is the real possibility today’s weakness will convince even more owners to sell in coming days, once they are pushed to their breaking point. Nothing rattles confidence like seeing everyone else running for cover and a bad open could lead to another bloodbath. This appears like another cookie cutter dip and capitulation bottom, but we will know the answer for sure in a couple of days. A decent trade is buying the dip and using recent lows as a stop.